We take our impact on the world seriously. 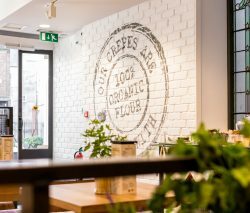 That’s why Crêpeaffaire have a plan in place to have a positive effect on the communities we serve, to reduce our environmental impact and to provide delicious, top quality food suitable for everyone, anytime. And we know there’s still more to be done with Corporate Social Responsibility (CSR) and Sustainability! Our delicious crêpes, waffles and mini pancakes are served on metal plates with steel cutlery when eating-in for most of our stores to avoid unnecessary plastic waste. Crêpeaffaire serves all hot drink-in beverages in our ceramic mugs or glass cups to reduce wastage where possible. We hate plastic straws! Over 8 billion plastic straws are thrown away each year- often ending up in our oceans. So we’ve taken action and over the last couple of months, we’ve rolled out paper straws across our stores – another way we’re helping to save the planet through CSR. We have various measures in place to ensure we don’t use up unnecessary energy in our stores. We offer fresh crêpes to takeaway in cardboard boxes or on-the-run card cones. We’re also introducing biodegradable cutlery in the near future. 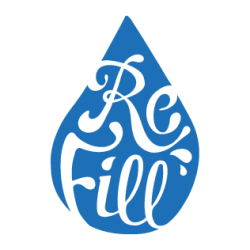 Refill is a free tap water initiative designed to reduce plastic pollution and promote healthy hydration by making refilling a water bottle easy, social and rewarding! We’re introducing this scheme across many of our stores to ensure you can stay hydrated easily and to reduce the plastic waste within our local communities. Find us on the Refill app here! We’re proud to serve 100% Fairtrade Organic Arabica beans, with maximum flavour quality. All our crêpes and galettes are made using organic flour, or gluten free organic buckwheat flour. We use natural fresh fillings to enhance every mouthful. We serve Teapigs in our stores – this is the only tea brand to have been awarded the Plastic Planet Plastic-Free Trust Mark! Free-from (but not free-from deliciousness) – we’ve extended our menu to offer something for everyone! Vegan? Dairy free? Gluten free? Vegetarian? Pescatarian? Lower calories? We’ve got your back! *Our stores offer products with peanuts, tree nuts, soy, milk, eggs, wheat and other allergens. While we take steps to minimise the risk of cross contamination, we cannot guarantee that any of our products are safe to consume for people with allergies. 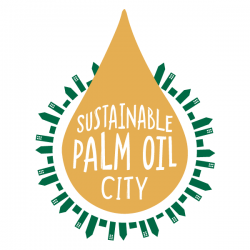 We believe in sourcing quality ingredients that are good for you, the planet and those who produce it. That’s why we only serve Fairtrade coffee at all of our stores across the UK. This supports the farmers and helps to ensure you never get a bitter sip of coffee at Crêpeaffaire. The local community matters! As part of our Sustainability & CSR strategy, we’re constantly striving to support local charities and communities each year. 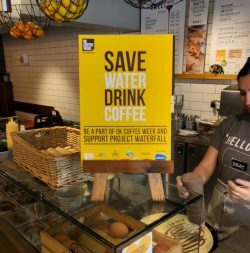 This year, we raised over £230 during UK Coffee Week to support clean water initiatives through Project Waterfall in Ethiopia. For every coffee bought, we donated 5p to this fantastic cause. Thanks to everyone that helped us to reach this figure! We’ve also provided over £200 worth of vouchers & goodies to local charities this year to help raise money for various projects and causes, such as Macmillan Cancer Support, Cancer Research, local societies, food banks & fayres to name a few! *T&Cs apply. Must show your valid NHS staff ID card, Blue Light Card, Rewards for Forces, Police or Rescue ID or student ID card. We also ask that you are registered on our loyalty app to claim the discount.